The beautiful community of Rosehaven is located in the city of Conway, South Carolina. There are beautiful pre-existing homes and new construction homes located in the community for resident to choose from. Residents love that the entrance and landscaping throughout the community is well-kept and maintained. The community sits across from the Smith-Jones recreation center which has a swimming pool, basketball courts, tennis court, ball fields, and a picnic area for you to enjoy. 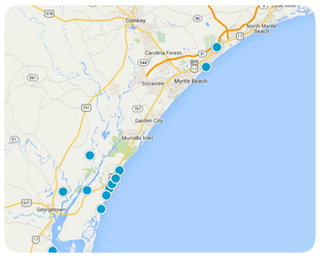 Residents are only thirty minutes from Myrtle Beach. This community is family friendly and has a country, hometown atmosphere. One of the greatest perks is that you are located far enough away from the hustle of the city to feel relaxed but close enough to enjoy all of the cities amenities. There are many areas for residents to enjoy shopping, dining, entertainment, nightlife, golf, and outdoor recreation nearby. Residents are also close to all of the amazing attractions located in the Myrtle Beach area. Feel free to take a look at the beautiful homes we have available and let us know if you have any questions or interest in any of our homes.